Flavius Julius Delmatius was a grandson of Constantius I and Theodora. He and his brother Hanniballianus were the sons of Delmatius, a stepbrother of Constantine the Great. 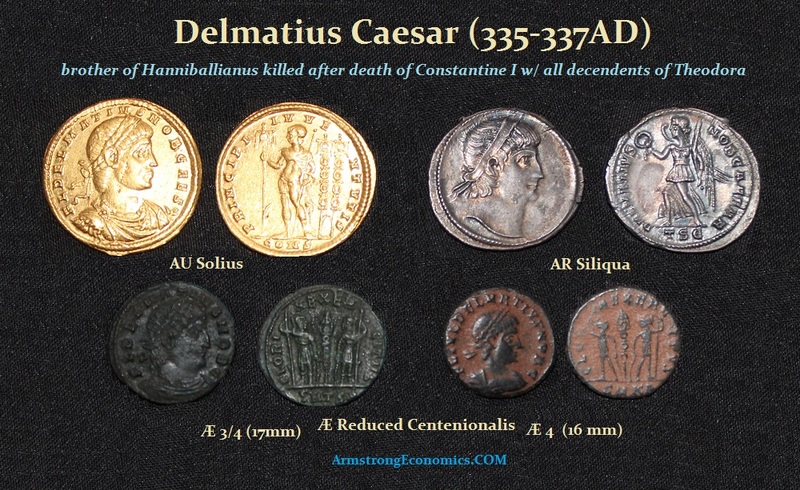 Delmatius was given the rank of Caesar by Constantine in September 335 AD. In the confusing period following the death of Constantine in 337 AD, the unfortunate Delmatius was one of nine male descendants of Constantius and Theodora who perished in a bloody massacre authorized by the late Emperor’s three sons, (Constantine II, Constantius II and Constans) who were obviously fearful of the potential threat to their authority.